The Hills weeping fig (ficus microcarpar var.) is a beautiful tree which in some cases provides a shady archway for many streets in our Sydney Eastern suburbs. But why are the residents of these streets pulling out their hair? The Hills weeping fig is like Jekyll and Hyde. Dr Jekyll brings shade in summer; tree lined streets become a breezeway, cooling our homes as their majestic branches cast shade and protect us from the searing summer heat, attracting birds to feed on their fruit twice a year. But, Mr Hyde is lurking. Those same fruit bring flying foxes…and other mysteries. My interest in this tree is the power of its root system. Their reach is widespread, sometimes 3 or 4 or more times wider than they are high. The root system will move stone walls, lift concrete footpaths and driveways and of course invade sewer and stormwater pipes. The roots from this tree just keep on coming after they are internally pruned with an electric eel or “Rattlesnake” high pressure water drain cleaner. 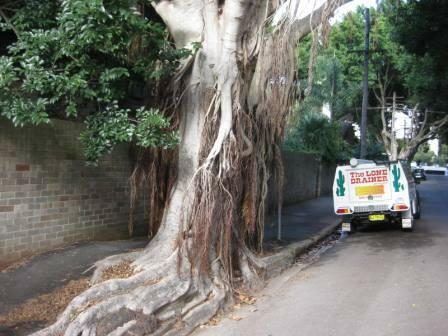 Last week we attended to 4 tree root sewer blockages directly caused by the Hills Weeping fig. The 2 blocked sewer pipes that particularly interested me were in PVC sewer pipes. Why is that interesting, I hear you ask? Well… tree roots don’t grow into PVC pipes! …..or do they? The Kensington blocked drain was in an established housing estate about 10 – 15 years old. The townhouse in question had no previous blocked drain history. The Hills weeping fig was about 30 metres away. Its root system had grown up to this house and had actually grown into the PVC pipeline through a screw on cap that we plumbers call a cleaning eye. The fine roots had grown into the cap thread and multiplied inside the pipe thus causing the sewer blockage. The Bellevue Hill blocked sewer was similar. This house was built during the year of Sydney’s 2000 Olympic games after the long term owners, were tired of having blocked sewer pipes every 3 months, and tree roots “growing up through the back of the toilet”, amongst other reasons. During the rebuild all the pipelines were installed in PVC pipes and fittings. The house finish was state of the art plumbing fixtures, with beautiful sandstone tiles around the outside of the house. All the pipes were concealed! No cleaning eyes! Why would we need access to the pipes as they have all been installed in tree root proof PVC? The nearest fig tree was 30 odd metres away. Well, what started as a simple blocked floorwaste, grew to removing that beautiful toilet suite to clear the blocked sewer pipe. We used the “Rattlesnake” high pressure water drain cleaner to remove tree roots from the blocked pipeline. When the blockage was cleared we carried out a camera survey of the pipeline. About 14 metres downstream the camera showed the remnants of the cut tree roots, but just as important, our drain camera survey showed the PVC pipe had been squashed. What was a round internal pipe, was now oval shaped with a crack in at least 1 of the fittings. Who said tree roots don’t grow in PVC sewer pipes? Yeah there is to massive figs tree in our front yard and backyard.in the drive way some of the brick is collapse from the fig tree.and we found some fig trees growing in our gutter with there roots growing into there roof.BUT some people were complaining about it so the government chopped them Down.now it looks horrible.tree expert came over and telled us that the fig trees roots were probably everywhere under the house.